Bhagwati Hospital is unit of Sarvodaya Health Foundation, Sector 13, Rohini Delhi -110085. Multispecialty Hospital (Including Cath Lab, Interventional Cardiology & Non Invasive Cardiology) Located in North West Delhi operational since 2002. State of the art Hospital is accredited with NABH, NABL, ISO 9001 : 2000 Certification. On the panel of CGHS , ECHS, DGEHS, FCI and many other prestigious organizations, insurance companies & TPA’s. 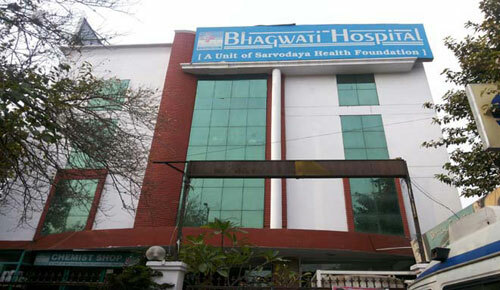 Bhagwati Hospital is unit of Sarvodaya Health Foundation, CS/OCF-6, Sector 13, Rohini Delhi -110085. Multispecialty Hospital (Including Cath Lab, Interventional Cardiology & Non Invasive Cardiology) Located in North West Delhi operational since 2002.Hospital is promoted by Sarvodaya Health Foundation and managed by Dr. Naresh Pamnani, MD (Medicine), Senior Consultant Physician, Founder Chairman of Bhagwati Hospital. Cardiology- Facilities Of ANGIOGRAPHY , ANGIOPLASTY. CS/OCF-6, (Near Printer Apartment), Sector-13, Rohini, Delhi-110085.